Fort Point and Lime Point define respectively the southern and northern flanks of the narrowest portion of the entrance to San Francisco Bay. 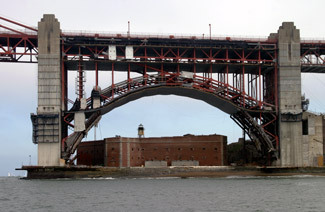 Given its prime location, Fort Point has been a desired spot for several construction projects over the years. First was a cottage-style lighthouse to mark the entrance. Next was a fort positioned to protect the entrance, and finally came the graceful Golden Gate Bridge to span the entrance. Evidence of the three projects is still visible on the point today: a tiny lighthouse sits perched atop the massive brick fort, which is overarched by the towering bridge. Fort Point Lighthouse with twin 1884 keeper’s dwellings. Note fog bell on wall of fort. The present, diminutive Fort Point Lighthouse is actually the third to stand at the point. 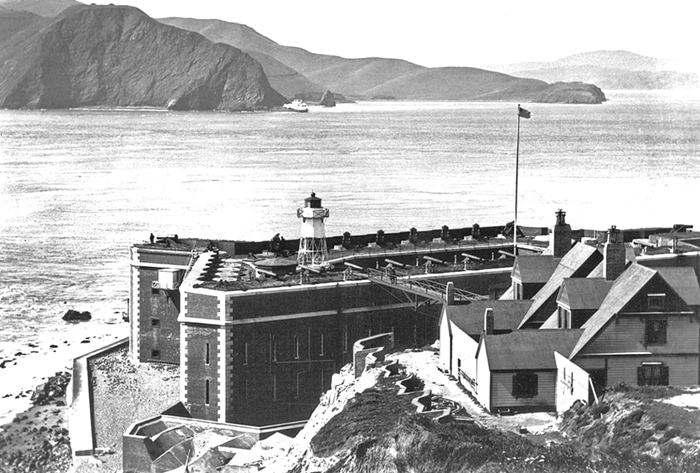 Construction of the original lighthouse and its twin on Alcatraz Island, just inside the bay, began in 1852. Fort Point Lighthouse was completed in 1853, shortly after Alcatraz Lighthouse, but both sat empty and idle awaiting the arrival of their lighting apparatus from France. Just three months after it was completed and before its Fresnel lens ever arrived, Fort Point Lighthouse was razed to make room for the construction of Fort Winfield Scott on the strategic point. Work on the fort began in 1854, when workers blasted the ninety-foot cliff down to a mere fifteen feet, so the fort’s bottom row of cannons could skip cannonballs across the water’s surface to penetrate ships at their waterline. The three-story fort, constructed of red-brick and granite, took seven years to build and was the only such fort on the West Coast. When the third-order Fresnel lens intended for Fort Point Lighthouse finally arrived, it was diverted to Point Pinos, where it remains in use today. 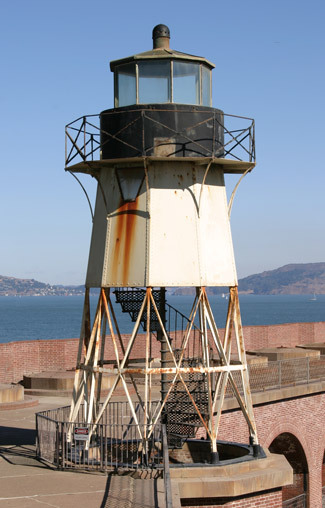 The second lighthouse at Fort Point, a squat wooden tower with four sides that sloped up to a square watchroom, was built on the narrow ledge between the fort and the water. 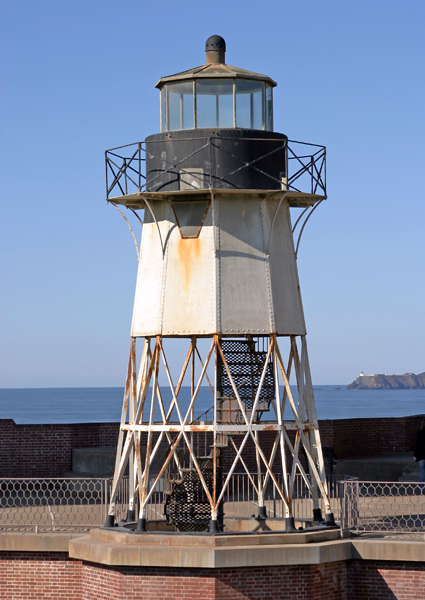 In March 1855, the light from a fifth-order Fresnel lens atop the thirty-six-foot tower was exhibited for the first time, making it the third lighthouse to be activated on the west coast. 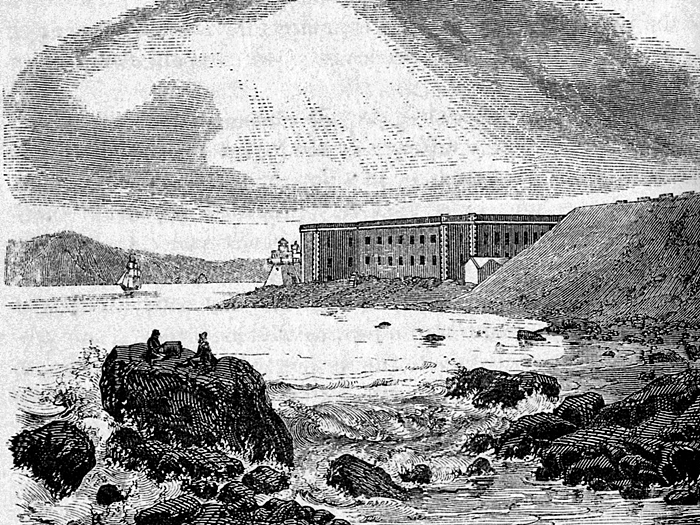 The strong tidal currents that pass through the Golden Gate undermined the shore near the fort, and the lighthouse had to be removed to facilitate the construction of a protective, granite-block seawall. 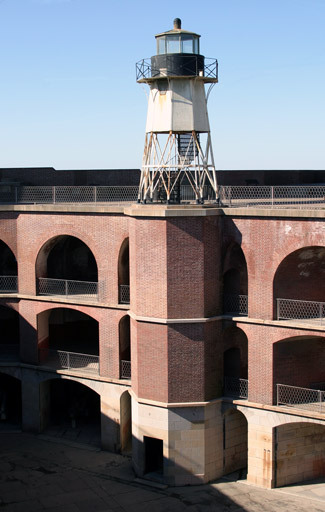 The wooden lighthouse was replaced in 1863 with Fort Point’s third and final lighthouse, a twenty-eight-foot-tall iron skeletal tower positioned atop one of the fort’s stairways. A circular iron staircase leads up into the nine-sided white tower, which is capped by a black lantern room from which a light was exhibited at a height of eighty-three feet above the surrounding water. In 1866, the station’s fog bell was removed from its framework in front of the fort and hung near the top of the fort’s seaward-facing wall. Reaching the bell was most likely the most hazardous duty for the keepers as it originally meant climbing down the seaward face of the fort on a rickety wooden ladder. After the fog-signal structure and machinery were badly damaged during a Fourth-of-July salute fired from the fort in 1867, lighthouse authorities took measures to prevent a recurrence of that accident. In May 1878, the characteristic of the light was changed from a fifth-order fixed white to a fourth-order fixed white varied every minute by a red flash. A seventy-pound weight, which required winding every two-and- a-half hours, was used to revolve the new lens. A wooden dwelling was built atop the bluff just south of the fort for the head keeper and his assistant. To reach the lighthouse and fog signal building, the keepers had to descend steep stairs on the bluff, enter the fort, and then climb a granite spiral staircase. The Lighthouse Board described this trek as “a very dangerous task during dark and stormy nights,” and consequently had a bridge built to span the gap between the bluff and the top of the fort in 1876. Two new keeper’s dwellings were constructed atop the bluff in 1884, and in 1897 a tramway with a hand-operated winch was built to eliminate the need for the supplies to be carried up the bluff on the shoulders of the keepers. After a 3,000-pound bell was relocated from Yerba Buena Lighthouse to Fort Point in 1880, the Lighthouse Board proudly reported: “This bell can be distinctly heard at Point Bonita, and now answers all the requirements of a fog-signal at this station.” Nearly two decades later, the Board changed its mind, and noting that the bell had “long been complained of as inadequate, both in position and power,” it requested funds in 1899 to place a Daboll trumpet atop the northwest bastion of the fort. Congress provided $7,000 for a new fog signal on June 28, 1902, and on September 30, 1904, a Daboll trumpet commenced operation atop the fort in a building situated eighty-five feet seaward of the lighthouse. The power of the light at Fort Point was also increased following the loss of the City of Rio de Janeiro through the installation of a new fourth-order lens in 1903 that changed the light’s characteristic to alternate red and white flashes, separated by five seconds. 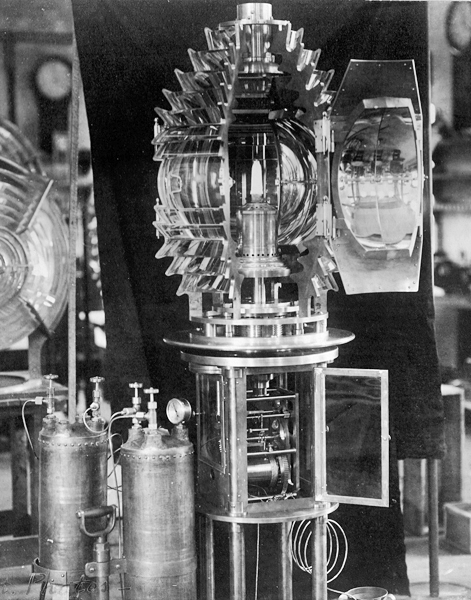 The characteristic of the light changed a final time with the introduction of a new lens in April 1912 that produced a white light that was on for one second and off for one second. 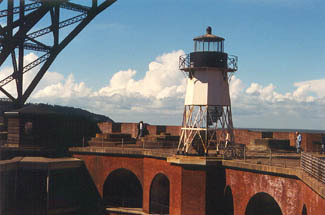 A second assistant keeper was assigned to the station in 1904 to help with the additional workload that accompanied the establishment of the new fog signal. 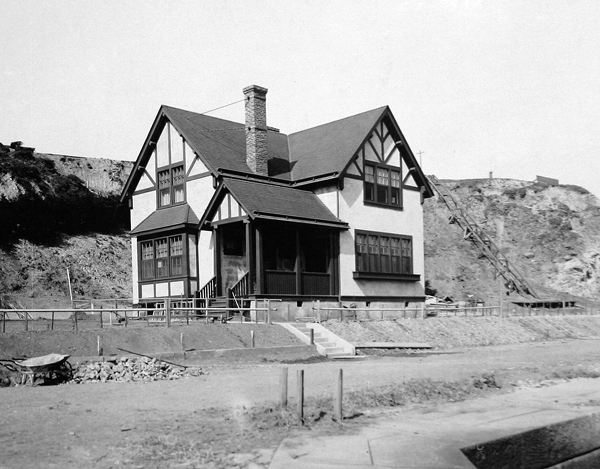 The two assistants were forced to share one of the two bluff-top dwellings until a new dwelling was built for the head keeper at the base of the bluff in 1908. 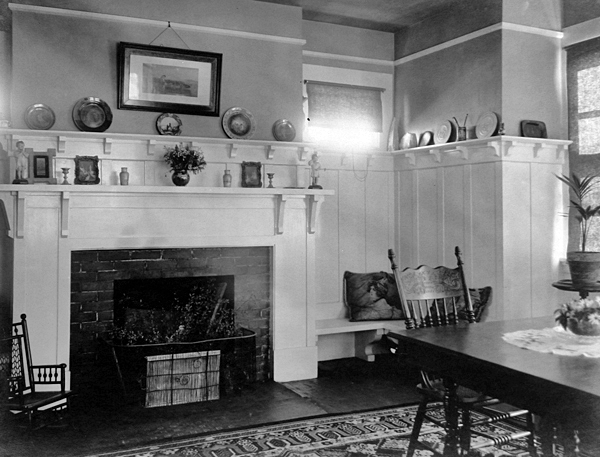 This new residence, which cost $6,466, had a kitchen, dining room, and living room on its first floor, and three bedrooms and a bath upstairs. When the powerful earthquake struck San Francisco in 1906, the chimneys of the bluff-top dwellings were toppled and the bridge leading to the fort was slightly displaced. James Rankin served as head keeper of Fort Point Lighthouse from 1878 to 1919, an unusually long stay for a keeper at one lighthouse. 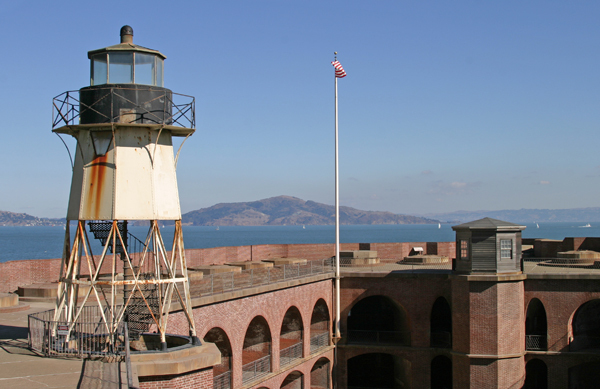 The fort today is considered a very picturesque setting, but it apparently wasn’t so for Rankin, who around 1915 told the following to a reporter from The San Francisco Call: “There is nothing here to see. There is the ocean and the sand and the guns and the soldiers. That is all. It grows monotonous. Always the ocean and the sand and the guns and the soldiers. As for the ships, one grows tired of them, too. I have my family and my pleasures.” Rankin’s “pleasures” included oil paintings, and he managed to produce several landscapes, consisting primarily of views from “monotonous” Fort Point. Although Rankin never became famous for his painting, he did receive special commendation for saving the lives of eighteen people during his service at Fort Point. One such rescue occurred on a Sunday afternoon, when two couples, after consuming a lovely picnic and washing it down with several glasses of wine, cranked up a portable Victrola and started dancing. One of the couples decided the granite seawall would make an exciting place to dance, and it did. After just a few turns, the couple lost their footing and plunged into the bay. A nearby fisherman, who had witnessed the fall, ran to find Rankin before the couple was swept too far seaward by the ebb tide. Rankin soon appeared on the scene equipped with his lifesaving equipment, a wooden ladder for descending the seawall and a life ring for flotation. The woman’s full skirt had filled with air during her fall, helping to keep her afloat. Her partner, however, proved less buoyant and had to fight to keep his head above water. Keeper Rankin, assisted by his son, soon had the couple back on terra firma. Before swimming out to the couple, Rankin had removed some of his clothing, which led the lady to proclaim, “I’ve never seen a naked man in my life except my husband!” Rankin’s final two rescues came in December 1918 and January 1919, when on both occasions he rescued a boy who had fallen from the sea wall. 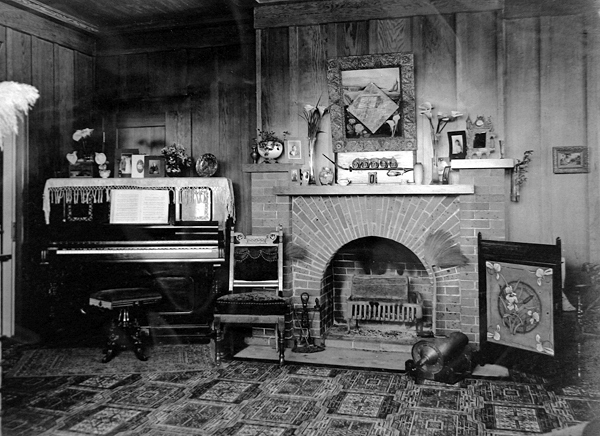 Rankin retired at the age of seventy-eight in February 1919, shortly after his last rescue, and was interred in San Francisco National Cemetery in the nearby Presidion when he died in 1921. In 1999, the Coast Guard named the fifth of its fourteen keeper-class buoy tenders James Rankin, in honor of the keeper’s meritorious service. The James Rankin is home-ported in Baltimore and responsible for servicing over 400 buoys on Chesapeake Bay and its tributaries. 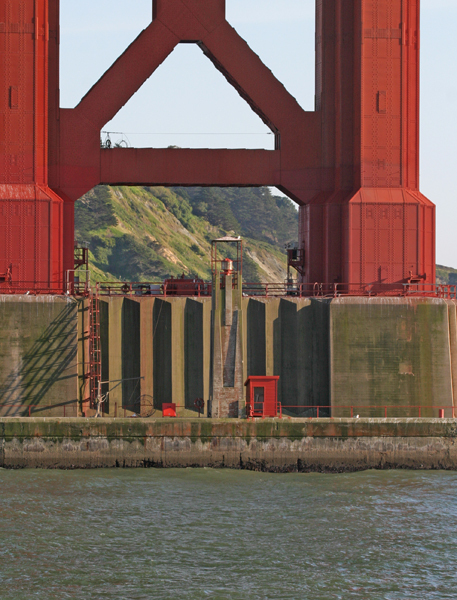 Work on the Golden Gate Bridge began in 1933, and Fort Point Lighthouse was soon obscured by its new neighbor. 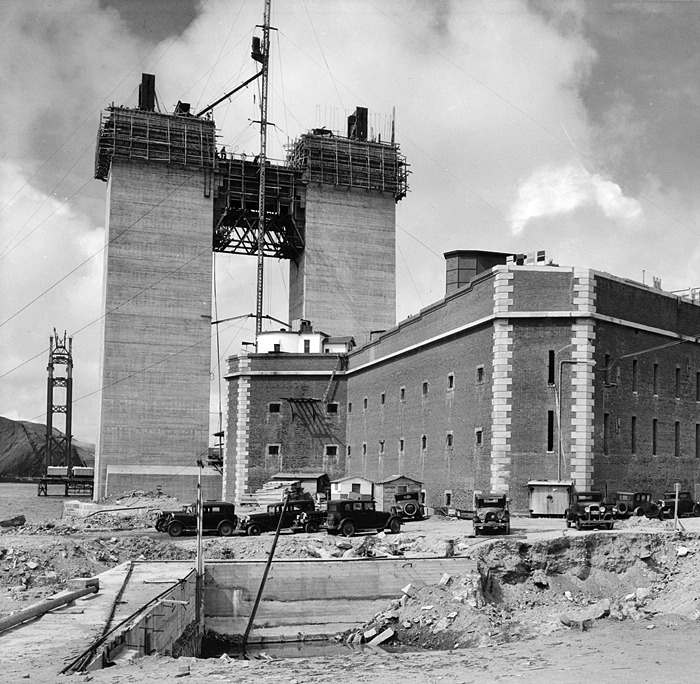 A fog signal and navigational light were placed at the base of the bridge’s south tower, and on September 1, 1934, Fort Point Lighthouse ceased operation. 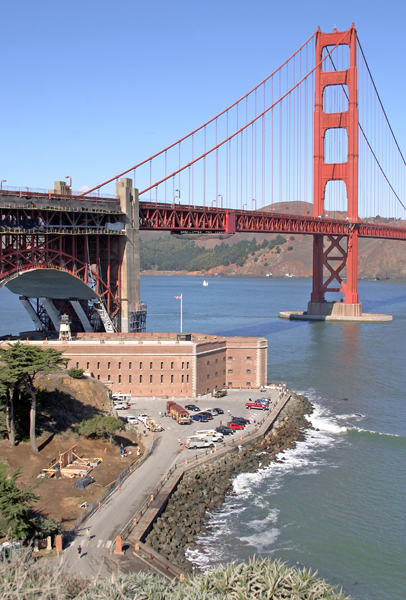 Fort Point became a National Historic Site on October 16th, 1970, insuring that the fort and lighthouse, though both now obsolete, will remain as reminders of the point’s important role in the history of San Francisco. Head: James Rogan (1853 – 1854), Charles Gilman (1854), Heman Doyle (1854 – 1855), B. F. Deane (1855 – 1858), J.C. Frackey (1858 – 1860), George D. Wise (1860), Henry Hickson (1860 – 1862), John D. Jenkins (1862 – 1863), George W. Omey (1863 – 1864), Lott Blanchard (1864 – 1866), R.S. Martin (1866 – 1869), Frank Thompson (1869 – 1871), John T. Huie (1871 – 1878), James Rankin (1878 – 1919), George D. Cobb (1919 – 1934). First Assistant: Sarah Rogan (1853 – 1854), Return J. Hunter (1857 – 1858), A.M. Hunter (1858 – 1859), George D. Wise (1859 – 1860), D. Dennison (1860), G.W. Thomas (1860), James Gormley (1860 – 1862), James Jenkins (1862), James Heron (1862), C.H. Warren (1862), George W. Omey (1862 – 1863), G.A. Braley (1863), J.J. Wickershand (1863 – 1865), Ann Blanchard (1865 – 1866), William Forry (1866 – 1867), Rachel L. Jones (1867 – 1868), Theresa Welch (1868), F.B. Morehouse (1868 – 1869), Mary Thompson (1869 – 1871), Sophie Huie (1874 – 1878), John Riley (1878 – 1879), W.P. McKeever (1879), Frank P. Stanyan (1879 – 1880), Frederick Meyer (1880 – 1882), Charles H. Mason (1882), George G. Bargstream (1882 – 1887), Edward W. Stafford (1887), Thomas H. Kelley (1888),Thomas J. Brown (1888 – 1891), Peter Jensen (1891 – 1893), Edward W. Stafford (1893 – 1897), Peter Baron (1897), Charles H. Nilson (1897 – 1899), George D. Cobb (1899 – 1900), Frederick A. Harrington (1900 – 1901), Charles A. Henderlong (1901 – 1902), Charles C. Bruehl (1903 – 1904), Johann R.C. Claus (1904), George D. Cobb (1904 – 1908), John Kunder (1908 – 1913), Samuel Sutton (at least 1915 – at least 1917), Ralph H. Jordan (1919 – 1934). Second Assistant: Arthur W. Pooley (1904 – 1905), George W.Cahill (1905), John Kunder (1905 – 1908), Samuel Sutton (1908 – 1913), Richard Graefe (at least 1915 – at least 1916), Richard H. Williams (at least 1917), Winfield S. Williams (at least 1919 – at least 1922), Leslie G. McKay (at least 1924 – at least 1930), John E. Gonzales ( – 1934). 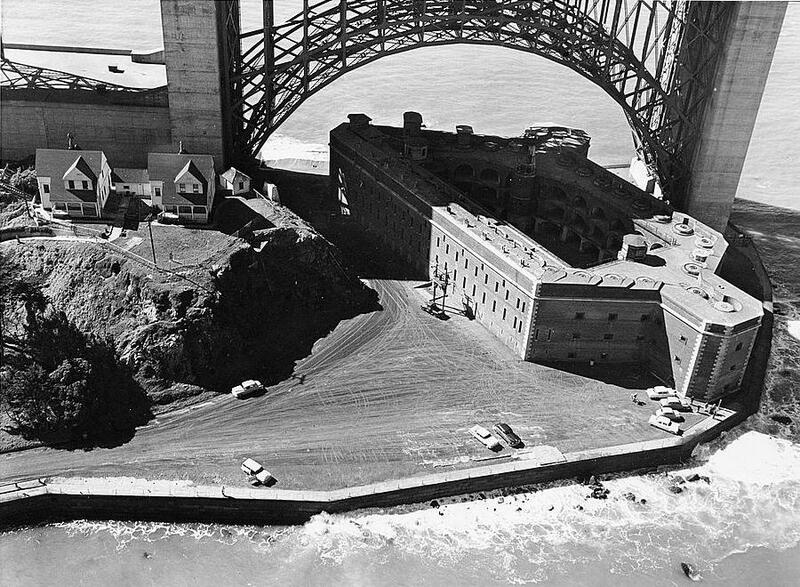 Located under the south end of the Golden Gate Bridge in Fort Point National Historic Site. 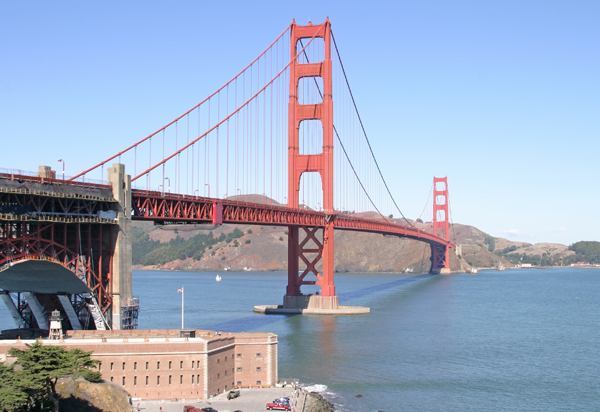 From north of San Francisco, take the Golden Gate Bridge south staying in the far right lane. After the toll booths, take the first exit to the right, and continue in a circle to the right, through an underpass, through the visitor parking lot, to a stop sign at Lincoln Boulevard. Turn left onto Lincoln and after about 1/4 mile turn left onto Long Avenue and drive until it dead ends at the fort. From the south, take Highway 101 North towards the Golden Gate Bridge, staying in the far right lane. Take the "Last San Francisco Exit," and drive through the parking lot to your right until you reach the stop sign at Lincoln Boulevard. Turn left onto Lincoln and after about 1/4 mile turn left onto Long Avenue and drive until it dead ends at the fort. The fort is open Friday, Saturday, and Sunday between 10 a.m. and 5 p.m. You can access the top of the fort where the lighthouse is mounted, but visitors are not allowed inside the lighthouse. 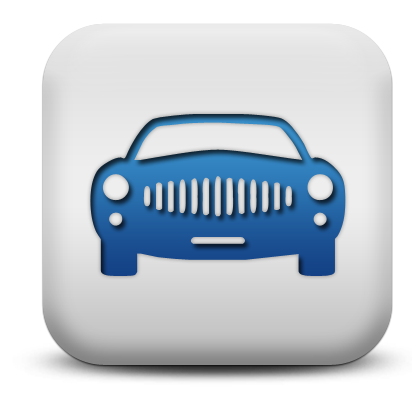 For more information, call (415) 556-1693. The lighthouse is owned by the National Park Service and is part of Fort Point National Historic Site. Grounds open, tower closed. I innocently asked a park ranger if we could climb up in the lighthouse. He said that was not allowed, and then added that he typically was only asked that question by children under ten. The light isn't much, but the fort is great and the view of the bay and surrounding points of interest is good.